The best way early childhood educators can encourage emergent reading is by creating classrooms and learning environments that surround children with meaningful text. This is often referred to as the whole language approach to reading instruction, but the truth is that emergent reading instruction…whether it be print awareness, or teaching phonics, phonological awareness, emergent writing or anything else…it all has to be meaningful, regardless of your approach to instruction. Upon moving to a new city, a four-year-old enters a new preschool mid-year. His previous preschool was mostly skills-based, with some play based learning, so little boy was very familiar with the letters and sounds of the alphabet. In fact, his teacher could point to any letter on the alphabet wall and he could identify both the upper and lower case letters as well as the sound that letter made. Surely, he comes to his new preschool with a lot of literacy background. But when arriving at his new preschool, there is less emphasis on learning isolated letter names and sounds, rather many literacy activities are integrated throughout the curriculum. One day the teacher plans a dictated story activity with the children, based on the month’s theme. She offers the children props and books to look at and invites them to draw a story of their choice and she would transcribe their words on their paper. When it is the new boy’s turn, he stared blankly at his new teacher. This kind of story is not uncommon. Clearly this little boy was taught a lot of alphabetic concepts at his previous preschool, but since they seem to have been taught in complete isolation of other literacy concepts, like print awareness, they actually held little meaning to the boy. He could not transfer what he had learned to other domains. The little boy was not taught phonics in a meaningful way. 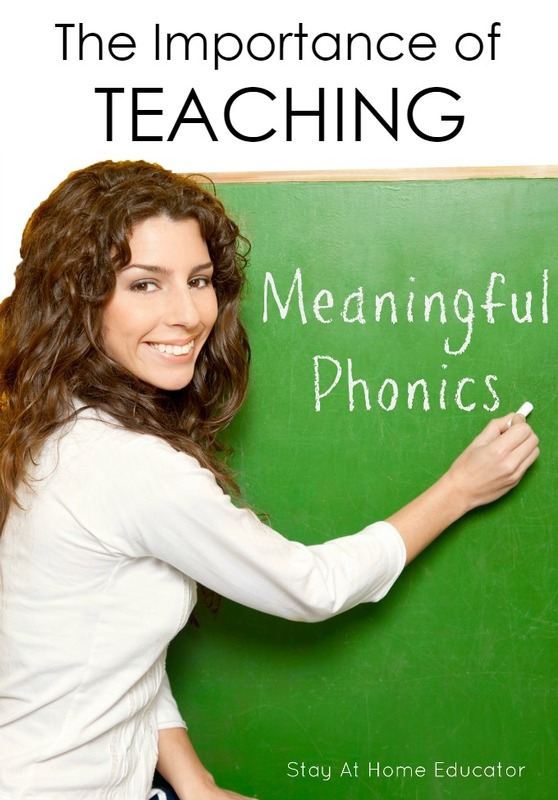 There is a misconception that phonics cannot be taught in isolation and still be meaningful. For example, advocates of the whole language approach often state that when taking a “letter of the week” approach, children do not make the connection between isolated letters and writing or other forms of print. The truth is, when phonics, ie: letter identification and sounds, are taught in an explicit manner that is systematic, it can still be meaningful. Because the instruction is still intentional and deliberate, just like teachers of whole language. Letter identification and sounds can be supported with unlimited whole language activities throughout each day and in many areas of the classroom. One of the most valuable things a teacher can do is to create a learning environment that is rich with literacy. This doesn’t just mean that letters and words are plastered all over the walls and in every center, but is also means that children have multiple ways to interact with literacy concepts independently and with peers and a teacher. By creating a literacy-rich environment, children will make connections between different forms and functions of print, including how isolated letters and sounds come together to make words and sentences. Attendance charts invite children to move their name from one side of a board to another if they are present. invite children to move their name from one side of a board to another if they are present. Morning sign-in where children trace or write their name to show they are at school, or young preschoolers can simply draw a line from a picture of themselves to their name. Predictable or interactive charts offer children predictable text with certain words they can move and manipulate, such as names. Manipulative games encourage children to explore letters or words by moving them in attempts to convey meaning. Name tags give children opportunity to see their name in print, which is very meaningful to them. Name tags can be used to assign seating during circle time, to assign centers, or I have seen some preschool classrooms use name tags as a way for students to check into centers they have chosen for themselves. Morning message or daily questions not only get children talking but when the teacher records their ideas children see their words in print. Environmental print like signs and labels help children make the connection that objects and areas have names, which also carry meaning. Dictated stories, where the teacher records word for word what a child says, is useful in helping children understand the relationship between spoken and written words. Reading pictures helps children understand that pictures support words in books and help tell the story. When children read pictures they are “reading” the story. Independent and shared story time teaches children to make a habit of reading and that reading is fun and social. Print in the dramatic play center helps children understand how print is used in life and gives them practice in using print to communicate with others, such as taking orders during restaurant play, or making a grocery list before shopping play. Journal writing allows teachers and children to track emergent writing progress throughout the course of the school year. Class books allow every student to contribute an individual page to a book. Predictable text works well for this as it allows children to make small changes and then when placed in the class library children can return to the book to read it again and again. But Wait…Where is the Phonics? Phonics refers to letters and sounds, so in the above activities, where is all the phonics, you ask? It’s interwoven throughout all the literacy opportunities in the classroom. Jenny comes to preschool everyday right on time. She removes her shoes, coat and backpack and places each in the labeled baskets right inside the door. The baskets are placed in a different order each day, requiring her to read each label (with picture) upon arrival. Jenny then goes to the preschool table where she scans the papers set out for the one with her name on it. It is our daily name practice. Jenny traces her name and then in the blank next to it, she attempts to write it. In circle time, Jenny particpates in our morning message. This morning, I write a sentence about the tulips in my front yard. “Ms. Sarah’s tulips are red and yellow.” Then, I invite the children to tell me about flowers they have seen. As a few childrne take turns sharing, I write word for word what they report, and we practice reading the sentences together. During oral language, I point to words in a poem written on chart paper, showing the children the one to one correspondence of the words I say to the words on the chart paper and proceed with an activity to develop language skills, such as responding to the text or using complete sentences. We sing the alphabet song and then I introduce the letter of the week. Jenny is excited to learn about the letter T. We discuss where we have seen the letter T before such as at the beginning of Tava’s name and at the end of Kent’s name. We talk about things we like the bagin with the /t/ sound, like trains and turtles. Dring phonics time Jenny also traces a sandpaper T, and handles toys that begin with the /t/ sound. She sorts our phonics pictures into two or three sets of sounds. During choice centers, letter manipulative have been placed with our bin of animals and Jenny matches the letters she knows with the beginning sounds of some of the animals. She discovers that there are many animals that begin with the same sounds. She then moves to the puzzles and table games area, where she carefully selects the game she wants based on the label on the box. She is not actually reading the name, but rather is reinforcing the association of the name with a specific game. Another student asks to join her, and together they pretend to read the instructions before playing. After the game, she looks for the shelf with the “games” label and put the game away. Then Jenny moves to the dramatc play center where she writes her name at the top of a grocery list and then checks the boxes next to pictures and words of items she needs to purchase. She needs turnips and tomatoes and doesn’t fail to notice they begin with the letter T we just learned. She does her shopping, and another student checks her list to make sure she has gottn everything. After centers, the chidlren gather for story time. I carefully select books that are not only theme related but that also can help us build our print awareness skills as well as phonics. I read aloud the book The Little Blue Truck, and we stop to point out the letter T in some words and how we hear it in some words. But Jenny brings to our attention some of the animals that are in the book are also in our animal bin, leading us into a review of other letters and sounds we know. I could go on. I haven’t even covered how letters and sounds naturally get incorporated into our writing center and even in math and science in addition to the many other emergent literacy skills we hit during a typical preschool day. But it is evident that a blended approach to preschool literacy can be very meaningful by including multiple opportunities for children to interact with letters and print. Of course, those experiences will be the most meaningful when they feel natural and authentic, which is why it is so important to thoughtfully place print throughout the classroom. It is often thought by early childhood educators that the approach taken in preschool literacy must be one or the other. Whole language or phonics. That is a huge misconception. Explicit phonics instruction can certainly have meaning to children when supported by quality print-related activities throughout the rest of the preschool day. 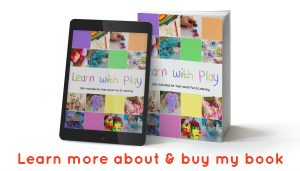 Looking for More About How to Teach Phonics? 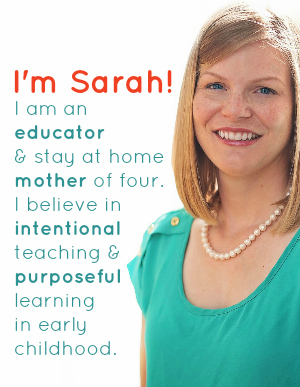 Hi Sarah, The scenario you outline here is definitely preventable. I bet your literacy bundle takes care of that. I have something that may complement it, too. I’m working on free phonics video lessons in the style of Khan Academy. The video for the letter b lesson, for example, shows beginning readers how to write out and sound out the lowercase and uppercase forms of the letter b. Then, it shows how the letter b works with other letters within a nursery rhyme. 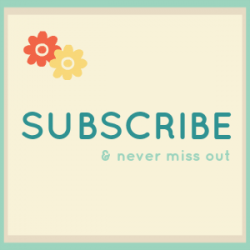 I have just five lessons published so far. 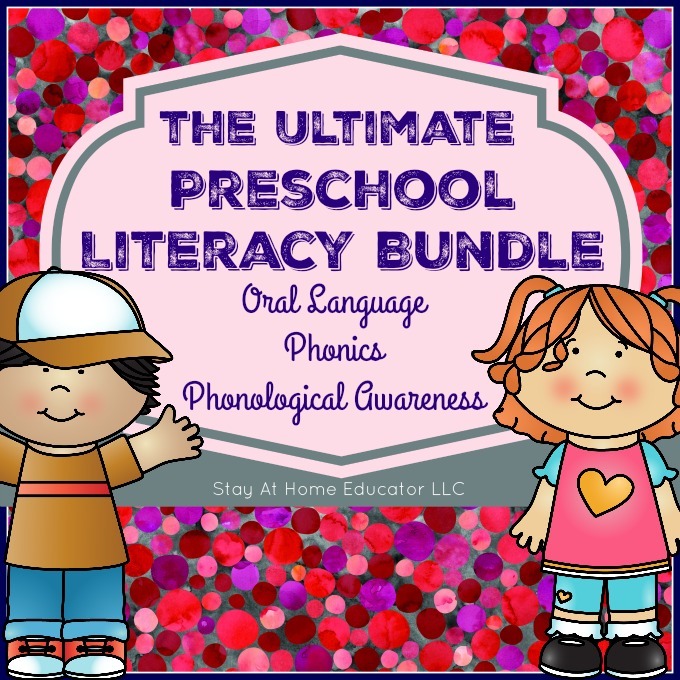 The plan is to cover all the letters, phonograms, and syllable types by publishing over 100 phonics video lessons. Here’s the letter b lesson if you want to check it out: https://storyhouracademy.com/letter-b-video-lesson/ Feedback is especially welcome at this point because I can implement suggestions at this early stage.